Thank you for your interest in FSR Sensor Contacts. Please complete and submit the form below and an ADInstruments representative will aim to get in touch within one working day. If you’d like to speak to someone immediately, office contact information is available from the contact page. Contains a pack of four sensor contacts. 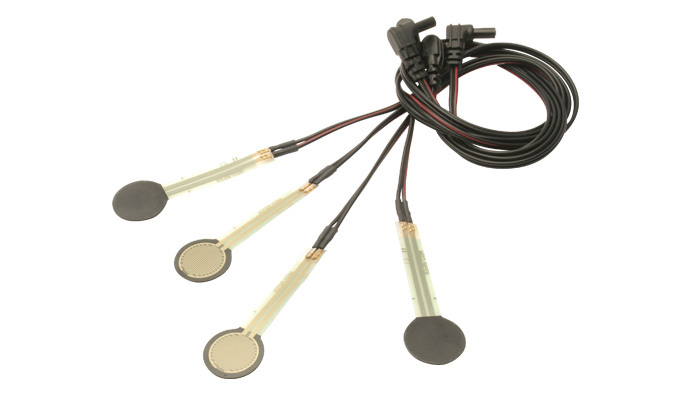 Each sensor contact has a 5.1 mm diameter active area and is designed to be used with Trigno 4 Contact FSR Sensor. Contains a pack of four sensor contacts. Each sensor contact has a 14.7 mm diameter active area. A pack is supplied standard with Trigno 4 Contact FSR Sensor. Contains a pack of four sensor contacts. Each sensor contact has a 39.6 mm square active area and is designed to be used with Trigno 4 Contact FSR Sensor. Each Force Sensitive Resistor (FSR) sensor contact is a single-zone Force Sensing Resistor, which is made from a robust polymer thick film sensor. Each Force Sensitive Resistor (FSR) sensor contact is a single-zone Force Sensing Resistor, which is made from a robust polymer thick film sensor. Its resistance decreases when an increase in force (0.1N - 10N) is applied to the surface of the sensor. They are designed to be used with the Trigno 4 Contact FSR Sensor and are supplied as a pack of four.